NordicTrack Incline Trainers are very clever and flexible hybrids: They can be used as a regular treadmill or tilted to provide the effect of a steep stair-climber. As reported on The Biggest Loser television show, incline training delivers results that are dramatically fast. Until 2011, the X7i was the top-level NordicTrack incline trainer. Since that time, the X9i and the X11i have been introduced. (The touchscreen Internet consoles on the new units make them noticeably more advanced compared to the X7i, which is still quite impressive.) The upgrades for 2014 on the X7i include a larger display and longer track. The X7i is a treadmill that we do recommend. However, due to some funny sales games, the X9i, which is even better, sometimes is less expensive! Just be sure that you compare prices rather than automatically choosing the simpler model. Efficient Workouts: The X7i, just like all of NordicTrack’s incline trainers, tilts up to a 40% incline. Jillian Michaels, the personal trainer from the Biggest Loser, has stated that working out at a 40% incline can burn five times more calories compared to walking flat. For added muscle toning, the machine declines 6%. Cushioning: Reflex Cushioning is featured on this unit, so there is a firm push-off point on one end and soft landing point on the other end of the track. It is much better on your joints compared to exercising on asphalt. Console: The new X7i includes a 10″ full-color touch-screen display. (This is an upgrade from the older versions which came with a 7″ screen). Also included is Google Trails technology, so you can hike virtually through Yosemite, Arches National Park and other landmarks as well. iFit Compatible: Get an iFit membership so that you can download new workouts on a daily basis. Other membership benefits include tracking your progress easily online and racing virtually against your Facebook friends. Audio: Hook an iPod up or another compatible MP3 player for working out to your favorite music. You also receive speakers that have great sound quality and convenient accessory shelf. Longer Track: Almost any runner will find this 60″ quiet incline trainer to be long enough. Commercial Motor: There is a lifetime warranty on the high-quality 2.75 HP motor. It quickly responds to changes in speed and incline and also runs quietly. The motor should be satisfactory unless you take it for very long runs often. Heartrate Monitors: The handlebars have grip pulse sensors built into them. A chest strap (which is sold separately can be used for a better readout. Wireless telemetry is also available. Solid Warranty: The new warranties from NordicTrack are quite impressive. This trainer now comes with a two-year labor warranty, five-year electronics and parts warranty; and lifetime deck, motor and frame warranty. None? We honestly don’t really have any complaints when it comes to the NordicTrack X7i. The only regret you will have when buying this incline trainer is when the more advanced X9i is selling for less money (which is the case sometimes). 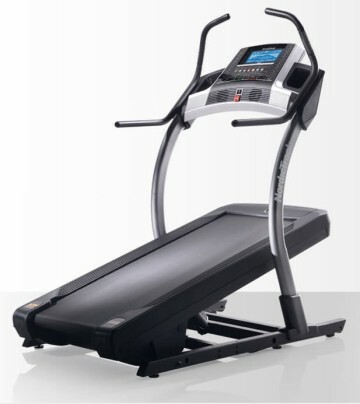 The NordicTrack X7i Incline Trainer is an excellent machine for nearly everyone. Enjoy a cushioned ride, a 10″ screen, iFit personal training and Google Trails realistic workouts. Just make sure that there isn’t an even better deal from NordicTrack when they are promoting the newer X9i. Also see our reviews on the X9i and X11i NordicTrack Incline Trainer reviews.